DESCRIPTION: Wood ducks, both male and female adults, have a crest on their head, a rectangular shaped tail, white bellies and white lines on the back of the wings. The sexes are dimorphic; males’ heads are iridescent green, blue and purple. Males also have red eyes, rust-colored chests, bronze sides and black backs and tails. Females are brownish to gray and have white eye rings, white throats and gray chests. 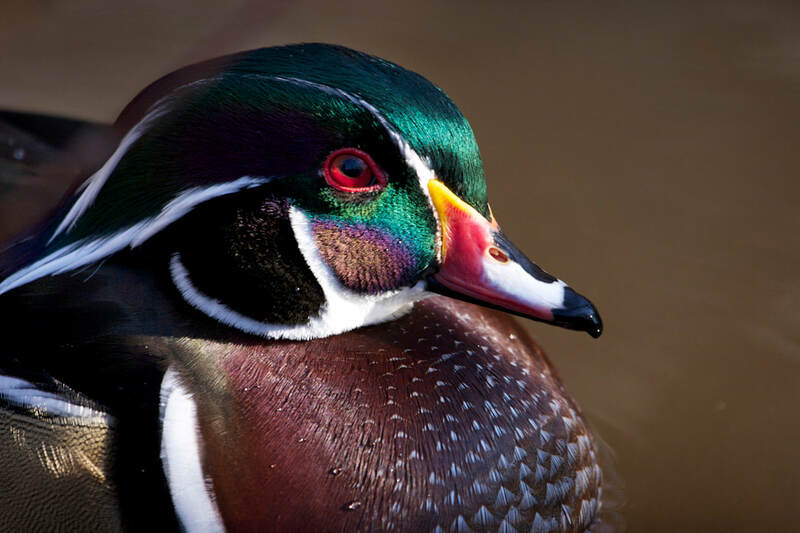 Wood ducks weigh an average of 1 to 1 ½ pounds. They are about 18 to 21 inches long, with males being larger than females. They have a wingspan of approximately 28 inches. RANGE: Found on the east coast of North America from Nova Scotia south to Florida and the Gulf of Mexico. They extend westward to the center of the U.S. They are also found from British Columbia to the Mexican border on the west coast. HABITAT: Occupy a variety of habitats including woodland areas along lakes, rivers, creeks and various other freshwater vegetated wetland areas. DIET: Omnivorous – feed on nuts, fruits, aquatic plants & seeds, aquatic insects and other invertebrates. 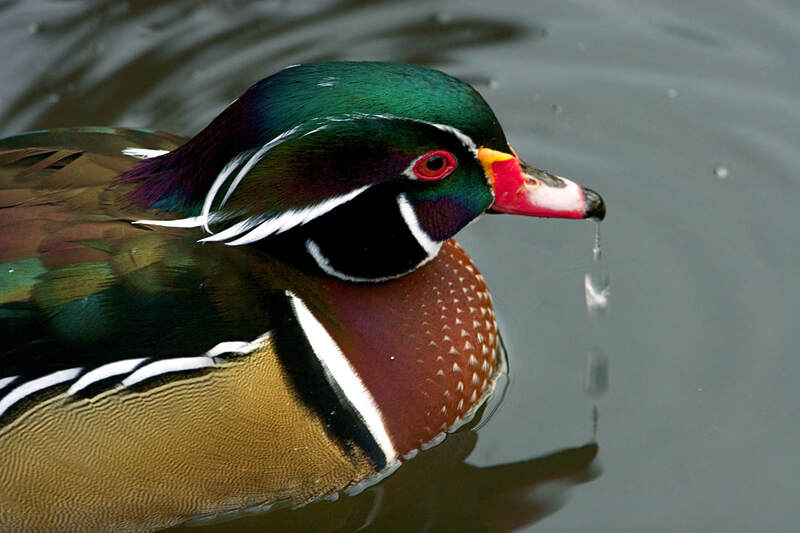 FAMILY LIFE: Wood ducks pair up in late winter and breed in early spring. Females are attached to males’ calls and attractive breeding plumage. They build nests in the cavities of trees or nest boxes provided by humans. Females lay 6 to 15 eggs. It is not uncommon for a nest to have more eggs, as females with lay their eggs in another female’s nest (a behavior called egg-dumping). Eggs are incubated for 30 days and chicks leve the nest within 24 hours of hatching. LIFE SPAN: Typically do not live past the age of 4 in the wild; can reach teens in human care.